What does being truly cultured really mean? Our Favorite Foods: Did you realize that almost all of our favorite foods – cheese, bread, beer, coffee, most condiments – yes, even chocolate … are ALL cultured or fermented foods? Eating More but Enjoying it Less? Learn how healthy and delicious, classic fermented food can restore real eating enjoyment while they jumpstart your digestion and immunity. What’s Wrong with this Picture? From antacids to yeast meds, obesity to antibiotics and pesticide resistance … Our health and environment is out of whack, on fire! What’s the Missing Link Tanking our Bottomline? 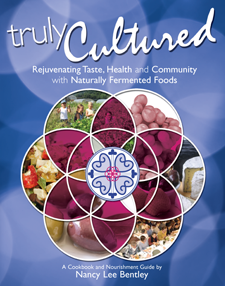 Fermentation and live cultured foods – like old time sauerkraut, yogurt and pickles – are the cheapest, easiest, quickest, most effective KEY to restoring our guts and our glory, rebalancing inner and outer ecology.